Heat oil in an available vessel,add mustard seeds allow to splutter. Then add chana dal and fry till golden brown, and add onions and curry leaves. Slightly saute onions for a minute and add the chopped beetroot and stir well. Then add chilli powder,turmeric powder and enough salt. 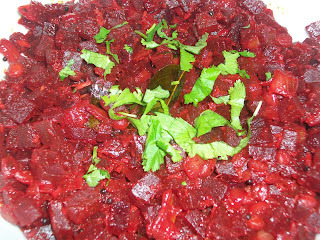 Stir well and again fry for 2 minutes and add water about 1/2 cup or the beetroot should be 80% immersed in water. Stir well and cook covered. till the water drains completely. Once the water drained add shredded coocnut and fry well. Remove from the stove and transfer to a bowl and add some chopped coriander leaves on the top. Now the Beetroot poriyal is ready to serve. This poriyal suits well with curd rice,lemon rice,rasam sadham,sambar sadham and other variety rices. 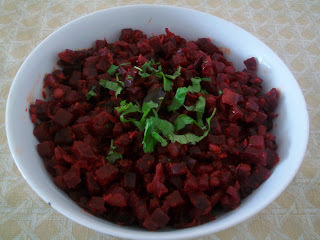 If u use red chilli or green chilli,it will be hard to notice with the beetroots and have a chance to bite the chillies .So its gud with the chilli powder.